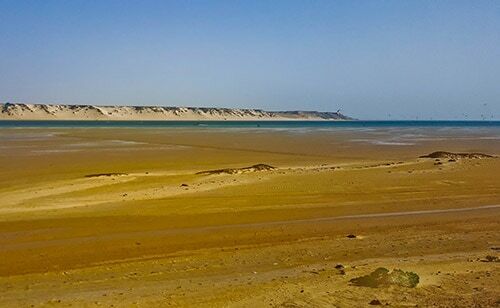 When searching for accommodation in Dakhla, it’s better to turn up and find a hotel. Booking online before you go is possible, but more expensive. There’s not much to do in Dakhla town centre, just a few hotels, restaurants and of course, the Assona Mosque. It’s a stop off point really, between Morocco and Mauritania. 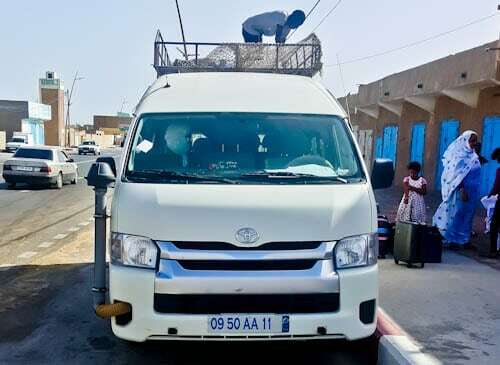 Most of the hotels are found around this area of downtown which is where you’ll also find a share taxi to Nouadhibou or Nouakchott early morning. Just north of Dakhla is a hugely popular kite surfing venue. In addition, they also offer Sahara desert tours. When I passed the kitesurfing area in the bus I saw at least 50 kitesurfers. I arrived late evening and asked around outside hotel Sahara for a share taxi the following morning. They recommended that I arrive at 7am and the taxi will leave right away. For this reason I arrived the next morning at 7am and there was no-one there, so I sat and waited. After waiting an hour, at around 8am, 3 more passengers came as well as a car and a driver. The driver who agreed to take me at 7am was nowhere to be seen. I was told that the car could not go with less than 6 people so I continued waiting. I began talking with another passenger from Japan. She persuaded me that we should hitchhike as it was already 11am. Therefore we went to tell the driver and all of a sudden he jumped up and had 6 people. He had been waiting for a 7th passenger but didn’t want to risk losing 2 passengers. We then left straight away for the border, the cost was 350 Dirham per person. Just as we were leaving, the driver who arranged to meet me at 7am arrived. He started complaining that I was going with another driver, despite being 4 hours late! If you do decide to hitchhike, you can take a petit taxi to the police checkpoint at the crossroads of the peninsula 7km away. This will cost around 25 dirhams. The taxi ride to the border was about 3 hours, with a short bathroom stop at a decent enough place. Arriving at the border, I got my exit stamp from Morocco before changing taxis from a 7 seater to a 4 seater. The 6 people in the taxi now had to squash into a normal car with a driver, it would have been worse if there was a 7th passenger! The taxi then crossed no mans land which is paved half way, I guess they are paving the rest and it should be completed soon. No mans land is covered with land mines so your life really is in the hands of the taxi driver! On arriving in Mauritania, I didn’t have a visa because the embassy in Rabat was closed. The Japanese tourist didn’t have her visa either but was confident of a visa on arrival as the Japanese travel sites say it’s possible. Firstly, we went into the police station where our passports were checked before being sent to the visa office. When I say visa office I mean a hot, dirty old room in the middle of the desert in which visas are issued. The rule is that those who are first time in the country need to get their fingers scanned and a photo taken by the webcam. As a result, no photocopies or passport photos are required. The cost is €120 or $150, no Dirhams accepted. I sat down, got my fingers scanned and photo taken, then the internet stopped working so I could not get my visa yet. Unfortunately, the internet never came back on that day so the police confiscated all passports until the following morning and told us we had to sleep at the border. The famous Borat lookalike heckler who’s mentioned in many blogs about the border crossing (he mainly bothers tourists with vehicles). After a night at the border the visa office was supposed to open at 9am but it was actually around 11am before it opened. The good news was that the internet was now working. For this reason, I could pay €120 for my 30 day single entry visa and get the hell out of there! 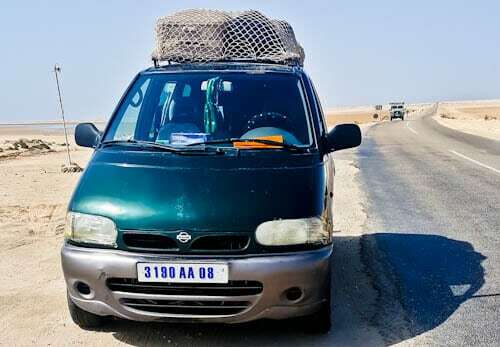 The taxi driver was already back to take us to Nouadhibou. Finally, I just had to tell the police which route I was taking through Mauritania and we were off. 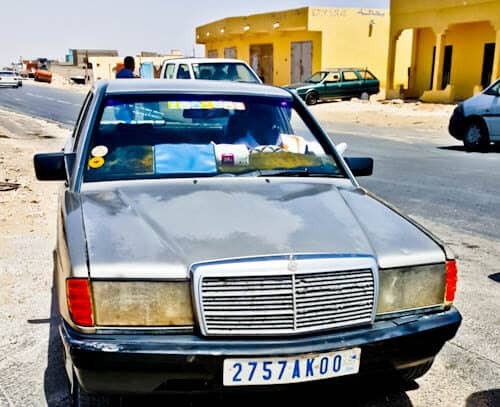 In Nouadhibou, the taxi dropped me off on the first roundabout on the way into town. Less than 30 meters from this point is the bus station for the minibus to Nouakchott which has free WiFi on board and takes about 5 hours. The company copies your visa several times to give to the police at the many police checkpoints. The bus stopped for one toilet break midway to Nouakchott. Oh, my goodness…I have no words for such a crazy experience! We always travel with the kids and I shudder at the thought of suddenly sleeping at a border until….whenever the wheels start turning again in the process to let you through. WOW!! So…..in the end….was it worth it??? Well, I survived it and continued my journey south. I wouldn’t recommend Mauritania, especially with kids! Such an exciting ordeal. I couldn’t stop reading about your adventure and kept wondering what was going to happen next. I would not have done this personally but you were a trooper and went through it. Good for you. Keep writing about your travels; I am enjoying it tremendously. Wow what an exciting trip! 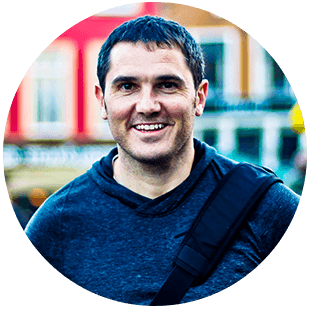 I love reading about less touristy places and your experience is going to be incredibly valuable to other travellers visiting the area. 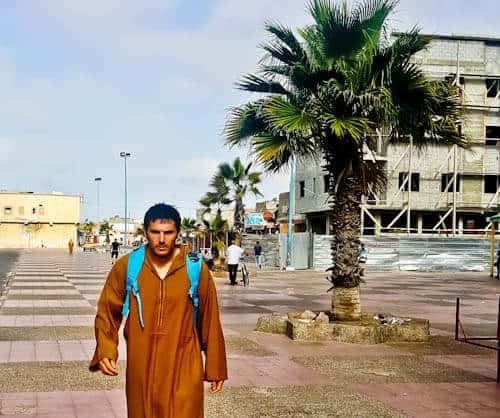 I am glad you find your way to Mauritania without bigger problems. The first thing that came to my mind after reading this was, I am never going here. I think you had an absolutely crazy trip. Were you scared handing over your passport overnight? I didn’t have a choice really, it was like being held hostage for my passport. At least I had some cash to buy some food and pay for a room for the night! What an experience! I am not sure if I would want to go there….agree to what Swati has written above! Was there place to spend the night? And was Mauritana worth all this? This is incredible.. Staying all night on border luckily you were allowed to stay at the border hotel, going back all the way would have been a pain. Good that finally you got your visa stamped not to mention all the time wasted in these processes and taxi delays. I would have had an anxiety attack if I went through your experience. I don’t know if I would travel there myself, but it at least you survived the ordeal and can now write about it. I”m hoping you don’t have to deal with anything of this sort in the future. Getting your passport taken from you can be quite scary. What an exciting trip and worrying trip. I love hitch hiking. I am so glad you chose to do that. I just went to a little bit of the Sahara desert when I was in that area on an organised trip but I enjoy it more doing things unorganised and seeing what happens. You should adapt a short novel or film a movie about this travel. I cannot believe these guys at the border held your passports overnight and let you stay at the border with some crazy people. 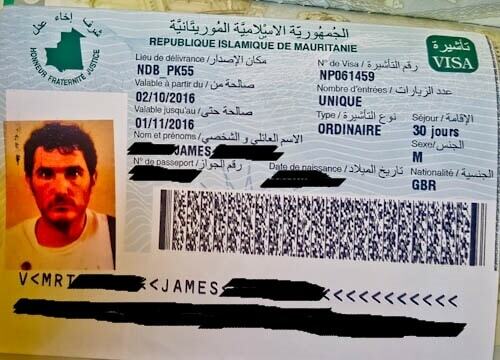 I will be freak out, refuse to hand in my passport, run away and not enter Mauritania ever. Although it is not a good experience for you, it is a very interesting read, probably the best post so far I have read on your blog. ONE QUESTION: do they accept EUROS at the Visa office in Mauritania? Hi, yes they accept Euros in the visa office. Have a good trip! Hi Chinedu – Wow you have some unique information here. I agree it’s a magical journey! Thanks for the link, I’m sure lots of people will find your writing and pictures invaluable! 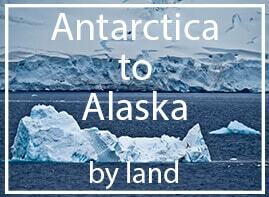 I’m thinking of doing this trip as a solo American woman in March. Any tips/advice/warnings? I doubt I’ll have a visa beforehand. The US travel alert for Mauritania s currently a 3 out of 4 for the road you took. East of there is a 4 out of 4. Do you know what it was when you traveled? Hi Diana. When I visited, the UK travel alert which was fine. However, I just checked today and they now advise against all but essential travel. When I visited I met a solo female traveler and the major nuisance she had was local men constantly approaching her. Also, speaking French would be a huge advantage.